A thug who attacked a man in the street, breached bail conditions and failed to comply with notification terms under the Sexual Offences Act is to be sentenced at crown court. 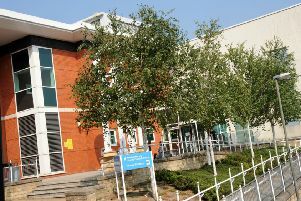 Chesterfield magistrates’ court heard on November 6 how Alex Marc Warren, 21, of Houldsworth Crescent, Bolsover, assaulted a man in the street in Grassmoor on October 7 concerning a dispute with the defendant’s sister. Prosecuting solicitor Becky Allsop said the complainant had been walking along on Wingerworth Terrace when he put his head up and heard the defendant shout his name and grab his top and pull him to the ground. Mrs Allsop added that Warren told the complainant he was going to fight him and he pushed him three times into a wall and punched him and allegedly headbutted him three times and pushed him again. The defendant told police the complainant had got in his face and he punched him and claimed he punched him again when the complainant had come towards him. However, Warren denied headbutting the complainant but said he had hoped the complainant would fall to the ground so he could stamp on his head. Warren was given bail conditions including not to enter the Grassmoor but he was later seen in the area on October 26. The defendant also failed to notify police of a change of address relating to Sexual Offences Act requirements after he had thought the details about his new bail address would have been passed on automatically. Warren pleaded guilty to assault by beating, and admitted a bail breach and also admitted failing to comply with address notification requirements under the Sexual Offences Act by failing to register a new address. Defence solicitor Julie Page said after Warren had been arrested for the assault he had to change his address because of new bail conditions and he felt these details would automatically be logged regarding his notification requirements. Mrs Page added that Warren accepts assaulting the complainant but he claimed the complainant had been squaring up to him and he does not accept headbutting him. Warren has significant mental health problems, according to Mrs Page, and has suffered the loss of his grandmother who had brought him up during most of his adolescence. Mrs Page also added that Warren had only returned to Grassmoor on October 26 to collect his belongings. District Judge Andrew Davison committed the case to Derby Crown Court for sentencing on November 27. Warren’s bail was revoked and he was remanded in custody.